Independent-expenditure groups already have spent much more on this year’s Seattle City Council races than in years past, and there are still months to go before the general election. 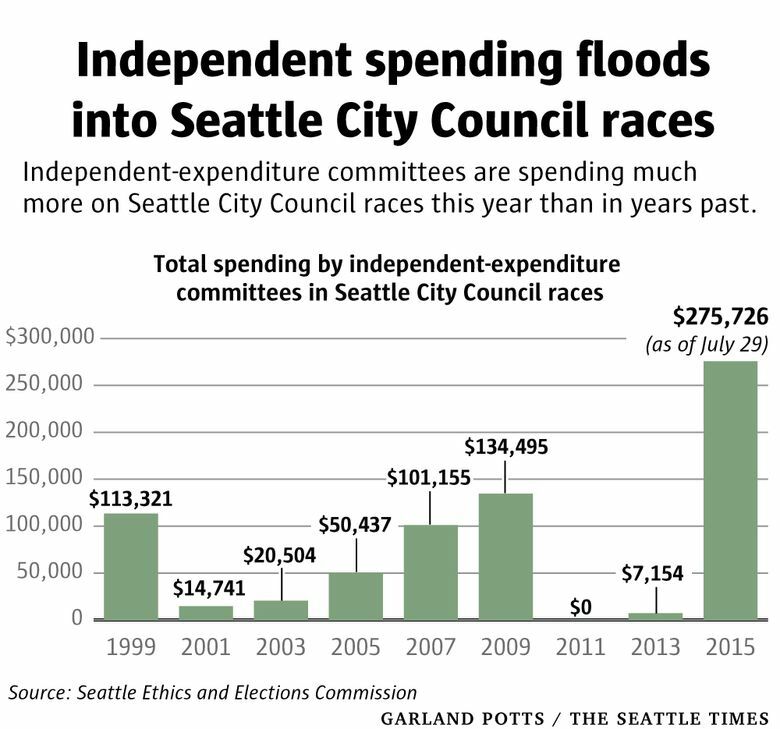 Independent-expenditure committees already have spent much more on this year’s Seattle City Council races than on past contests. Though the primary election is Tuesday and the general election is still months away, independent spending on the races has surpassed $275,000. That’s double the outside money spent on primary- and general- election council races in 2009, when independent-expenditure committees chipped in $134,495. Even fewer independent dollars were spent on races in the seven other election cycles since 1999, the first year for which records are readily available. 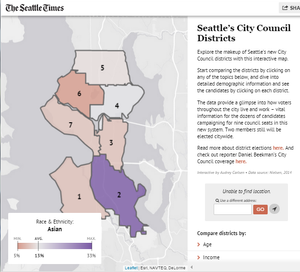 Interactive map: Click to see primary election results and explore the demographic makeup of Seattle’s new City Council districts. These political committees aren’t allowed to coordinate with candidate campaigns. But they can advocate on their own for or against specific candidates. “This spending is significantly higher than what we’ve seen going back to 1999,” said Wayne Barnett, executive director of the Seattle Ethics and Elections Commission. One reason for increased independent spending may be the sheer number of council seats up for election this year — all nine, as seven of them move from citywide voting to voting by geographic district. There were only four races in 2009, for example. There are other reasons, as well, according to people keeping close tabs on the money. They say the move to district voting, a lack of incumbents in some races, tussles over inequality and crowded primary ballots are attracting independent dollars. How much those dollars will sway voters is unknown. But there are no limits on the size of contributions to independent-expenditure committees, so the money can dwarf spending by actual candidates. Contributions to individual candidates are capped at $700 per donor. In District 1, for instance, People for Shannon has spent more than $70,000 to advocate for Shannon Braddock — more than any one of the nine individual candidates have spent, including Braddock herself. Ben Anderstone, a political consultant not currently under contract with any council candidate, said independent money is up partly because of district voting. There are 414,359 active voters registered in Seattle, but the new council district with the most, District 6, contains only 67,592. District 2 has the fewest — just 49,456. “With fewer voters your dollar goes further,” Anderstone said. That reasoning applies even more so in districts with a large number of primary candidates, such as District 1, which covers West Seattle, Delridge and South Park. Because nine hopefuls are running there, one could conceivably make the general election with as few as 5,000 votes, Anderstone said. Two in each race will advance. The District 1 race has been a money magnet also because it lacks an incumbent. Sean Martin, spokesman for the Rental Housing Association (RHA), a landlord group with a Political Action Committee that’s given $10,000 to People for Shannon, said open seats are rare. 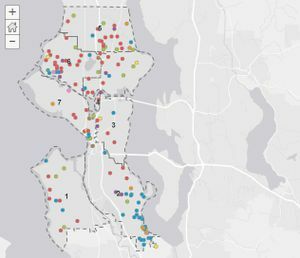 District 5, which covers most of North Seattle, has attracted even more independent money — over $100,000. Like the District 1 race, the District 5 race has a lot of primary candidates — eight, to be exact, and like the District 1 race, it lacks an incumbent. “The new system has scrambled things up and with an August primary, the turnout isn’t going to be high,” said Sage Wilson, spokesman for Working Washington, which advocates for low-wage workers and which has registered an independent-expenditure committee of its own. Then Wilson brought up another potential reason for the spending explosion: battles in the city between some business groups and others, including some labor unions. Wilson, whose organization has launched a website tracking business money in the races, noted an independent-expenditure committee controlled by the National Association of Realtors has spent about $65,000 to promote District 5 candidate Kris Lethin, who opposes rent control. Besides contributing to People for Shannon, the RHA has given $10,000 to People for Rob, an independent-expenditure committee for District 4 candidate Rob Johnson. Martin, the RHA spokesman, said one of Braddock’s opponents, Lisa Herbold, and some of Johnson’s opponents, have been talking about rent control. 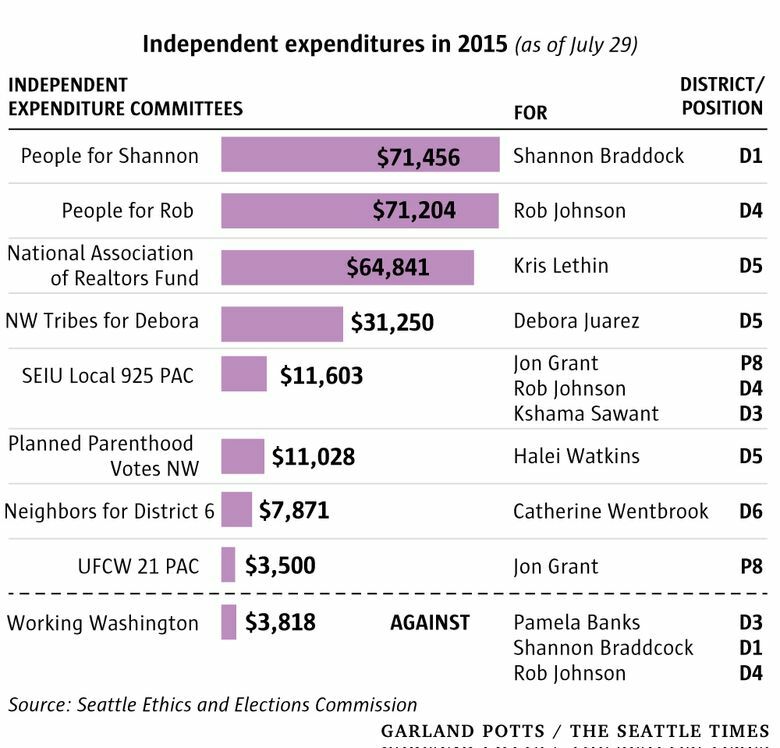 People for Shannon and People for Rob have each used $44,000 contributions from the Seattle Metropolitan Chamber of Commerce’s political arm to buy television ads. People for Rob also has raised $20,000 from a restaurant- and hotel-operators’ PAC. Sandeep Kaushik, spokesman for People for Rob and People for Shannon, said the group has spent for Braddock and Johnson because they’re “strong progressives with experience in government” and who are willing to have conversations with the business community. Unions also are involved. SEIU Local 925, which represents child-care workers and other educators, controls an independent committee that’s spent more than $11,000 to promote Position 8 candidate Jon Grant, District 3 candidate and current Councilmember Kshama Sawant, and Johnson. Tell us: What’s the most important issue in your district? Click to tell us which campaign issues are shaping the debate in your neighborhood. Johnson said his support from business and union independent committees is proof his positions have widespread appeal. Unlike People for Rob, his own campaign has spent most of its money on mailers and doorbelling because, “We knew we couldn’t afford TV,” Johnson said. “I’m in a great position to win without outside help and the narrative painted now is that I’m an outsider, when in reality I’m a great district candidate,” she said. Lethin, who hadn’t gained much visibility before the Realtors’ independent committee jumped into the District 5 race, said he was surprised but grateful. Lethin is a Realtor himself. Some proponents of district voting said it would render money less important, and the change has indeed made it less costly for candidates to mount a basic campaign. But Jason Bennett, a consultant, said big money will continue to flow. Districts have made candidates less dependent on deep-pocketed donors, but those donors still want outsized influence, so they’re turning to independent-expenditure committees, he said. Bennett, in fact, is working with Neighbors for District 6, a committee funded by maritime-industry and railroad players supporting Catherine Weatbrook against Councilmember Mike O’Brien. Information in this article, originally published July 30, 2015, was clarified July 31, 2015. Sandeep Kaushik is spokesman for People for Rob and People for Shannon, not for those two committees’ main contributor, the Seattle Metropolitan Chamber of Commerce’s political arm.